Here's the horrific 7mb (ugh!) PDF (ugh!) scan (ugh!) of the San Francisco Planning Department Notice of Preparation that an EIR is required for the Francisco Transbay Terminal / Caltrain Downtown Extension Project. From this was created the below, a roughly-HTMLised version of the document, created by scanning an Nth-generation photocopy, using some cheap OCR program, and half-heartedly correcting some of the many mistakes while hand-inserting HTML formatting. Isn't it great that computers are our servants here in the future? Figures scanned from an Nth-generation photocopy of a document which was originally produced electronically. Bagbiters all. The JPB, the City, and the Agency need to know the views of your agency as to the scope and content of the environmental information that is germane to your agency's jurisdictional or regulatory responsibilities in connection with the proposed project. 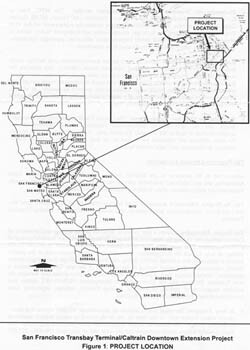 If your agency is a responsible agency or trustee agency as defined by State California Environmental Quality Act (CEQA) Guidelines (Sections 15381 and 15386), your agency will need to use the EIS/EIR prepared for this project when considering your permit or other approval for the project. If your agency is not a responsible or trustee agency as defined by CEQA guidelines, or if you are an interested individ1:lal or organization, we would still appreciate your views on the scope of the environmental document for this project. The project description, location maps, and probable environmental effects are described herein, along with dates, times and locations of project scoping meetings. The project has the potential to have a significant effect on the environment, and an EIS/EIR has been determined to be required. Pursuant to State CEQA Guidelines 15060( d) and Section 31.23 of the San Francisco Administrative Code, no initial study has been prepared. Due to the time limits mandated by state law, your response must be sent at the earliest possible date, but no later than 30 days after the receipt of this notice. Please send your responses before April 18, 2001 to Joan Kugler, AICP, EIR Project Manager, San Francisco Planning Department, 1660 Mission Street, Suite 500, San Francisco, CA 94103-2414. Please include the name of an appropriate contact person in your agency for continued EIS/EIR coordination. Extend Caltrain commuter rail service from its current San Francisco terminus at 4th and Townsend to a new underground terminus underneath or near the proposed rebuilt Transbay Terminal. The EIS/EIR will also review establishment of a redevelopment plan and related development projects, including transit-oriented development, on publicly-owned land in the vicinity of the new multi-modal facility. The plan and related development are intended to assist in financing of the transportation improvements. Maps showing the project location are provided in Figure 1. Previous studies relevant to this action include the recently completed Transbay Terminal Study (Metropolitan Transportation Commission, 2001) with associated technical reports regarding such subjects as Transbay Terminal design options, joint development options, terminal transit and train operations, and the Draft Environmental Impact Statement/Draft Environmental Impact Report (DEIS/DEIR) for the Caltrain San Francisco Downtown Extension Project (FTA - U.S. 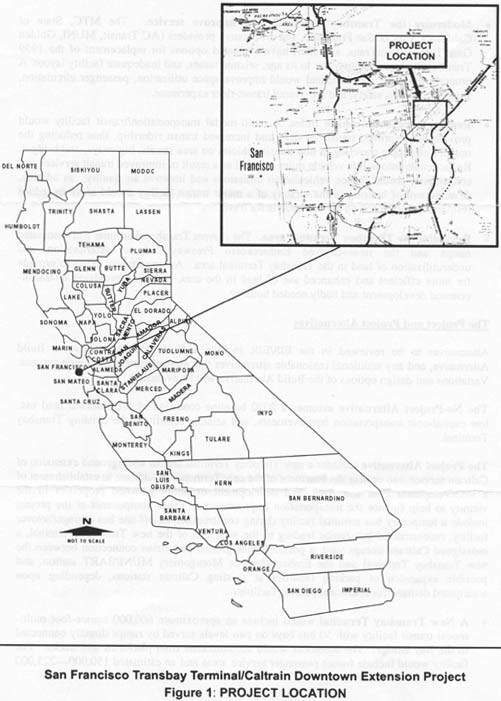 DOT / Peninsula Corridor Joint Powers Board, 1997, State Clearinghouse #95063004). The JPB, City and Agency will prepare one environmental document that satisfies both the National Environmental Policy Act (NEPA) and CEQA requirements. Improve public access to bus and rail services. 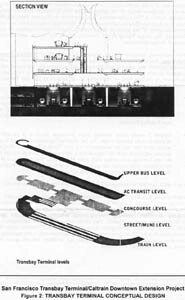 A multi-modal transportationl transit facility would provide a centralized location for bus (AC Transit, MUNI, Golden Gate Transit, Sam Trans, Greyhound), paratransit, and rail (Caltrain) services in San Francisco's growing Financial District/South of Market Area. An efficiently designed facility, accommodating multiple transit providers, would enhance transit services for passengers arriving in and departing San Francisco. 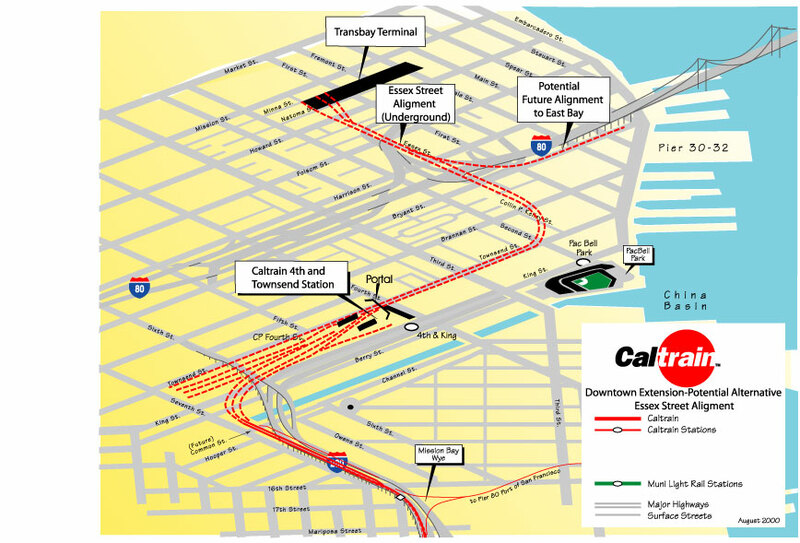 Extension of the Caltrain system from its current terminus at 4th and Townsend Streets to a new Transbay Terminal reconstructed at the present site would improve access to rail services for employees and residents in San Francisco's high-density financial area and provide better access to other local and regional transit providers. 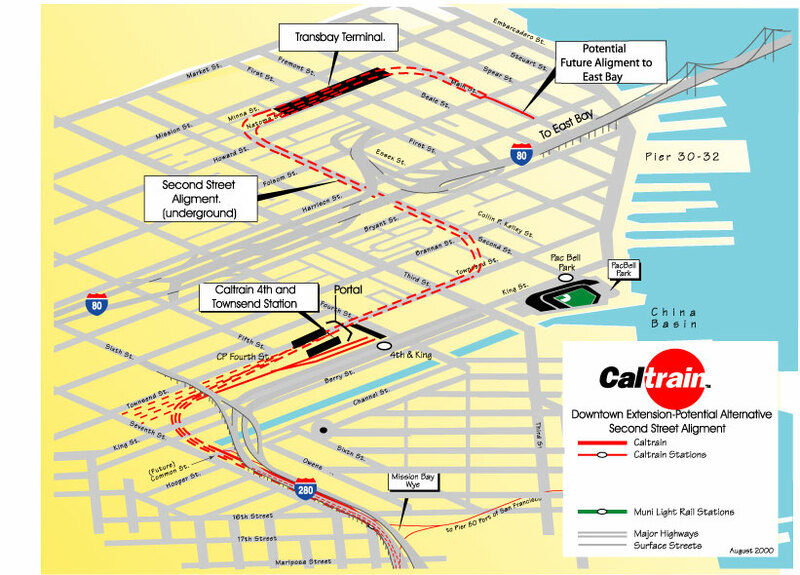 Additionally, a multi-modal facility and Caltrain extension would set the stage for an expanded modern regional electric express train service and potential statewide high-speed rail service. Modernize the Transbay Terminal and improve service. 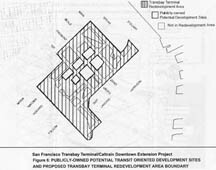 The MTC, State of California, City of San Francisco, and area transit providers (AC Transit, MUNI, Golden Gate Transit, Sam Trans, and JPB) have evaluated options for replacement of the 1939 Transbay Terminal facility, due to its age, seismic issues, and inadequate facility layout. A properly designed, new terminal would improve space utilization, passenger circulation, signage, security, safety, and the overall transit-rider experience. Reduce automobile vehicle miles. A multi-modal transportation/transit facility would provide for improved transit services and increased transit ridership, thus reducing the number of people traveling in non-transit vehicles on area streets, highways, and bridges. Reduction in automobile vehicle miles traveled as a result of improved transit services and connectivity would reduce vehicular air emissions and improve air quality. In addtion, development of housing in the vicinity of a major transit facility should serve to reduce residents' dependence on the automobile for travel. Revitalize the Transbay Terminal area. 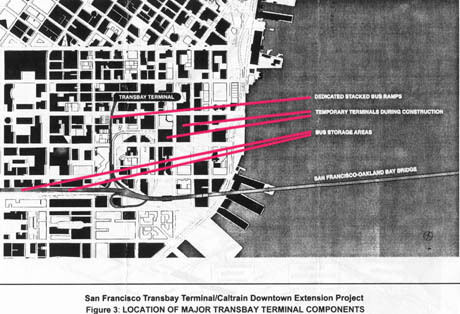 The current Transbay Terminal and associated ramps and the now-removed Embarcadero Freeway led to deterioration and underutilization of land in the Transbay Terminal area. An opportunity exists to provide for more efficient and enhanced use of land in the area, including provision of transit-oriented development and badly needed housing. Alternatives to be reviewed in the EIS/EIR include a No-Project Alternative, a Build Alternative, and any additional reasonable alternatives that emerge from the scoping process. Variations and design options of the Build Alternative will be evaluated. The No-Project Alternative assumes a 2020 baseline condition of programmed land use, low-capital-cost transportation improvements, and seismic retrofit of the existing Transbay Terminal. The Project Alternative includes a new Transbay Terminal and an underground extension of Caltrain service into or near the basement of the new Terminal, in addition to establishment of a Redevelopment Plan and Area, and development of publicly-owned properties in the vicinity to help finance the transportation improvements. Other components of the project include a temporary bus terminal facility during construction, an off-site bus storage/layover facility, reconstructed bus ramps leading to the west end of the new Transbay Terminal, a redesigned Caltrain storage yard, a possible underground pedestrian connection between the new Transbay Terminal and the Embarcadero or Montgomery MUNI/BART station, and possible expansion of parking facilities at existing Caltrain stations, depending upon anticipated demand for additional parking facilities. A New Transbay Terminal would include an approximate 600,000 square-foot multi-modal transit facility with 50 bus bays on two levels served by ramps directly connected to the Bay Bridge. The basement would accommodate train platforms and tracks. The facility would include transit passenger service areas and an estimated 150,000 - 225,000 square feet of retail, entertainment, conference, educational, and cultural space. Figure 2 shows a conceptual design for the facility. During MTC's Transbay Terminal Study, this concept, known as "Great Expectations," was adopted by the Transbay Panel and the Bay Area Toll Authority (BATA), following a review of multiple design options, including an extensive review of two additional design options. Figure 3 shows locations for the new Terminal, bus ramps leading to the Terminal, off-site bus storage, and a temporary terminal during construction. 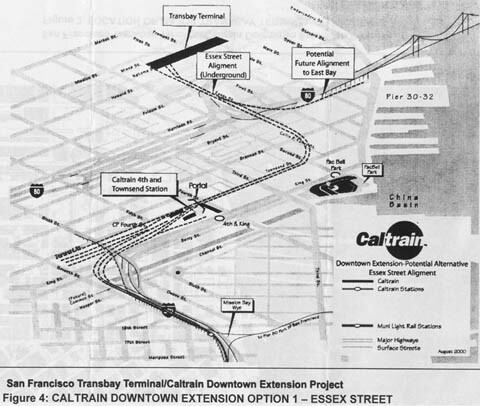 Two preliminary design options are proposed for review for the Caltrain Downtown Extension. Key Criteria used in developing the two design options include: (1) ability to provide efficient and effective rail operations and accommodate high-speed rail1, (2) potential impacts to land use and proposed developments, (3) potential for a future rail connection to the East Bay, (4) relationship of rail services to Transbay Terminal and transit operations, and (5) anticipated community impacts. Option 1 would follow the 1997 Draft EIS/EIR "long-radius, short mined tunnel" alignment from 4th and Townsend to Essex Street. 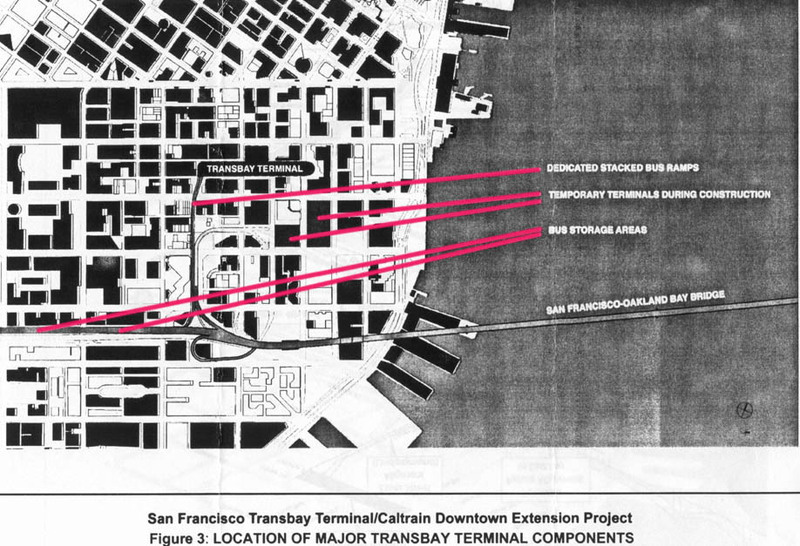 From there, the alignment would continue north underground as cut-and-cover construction to a station generally oriented north-south, terminating at Minna Street just to the west of the new Transbay Terminal. Option 2 would curve northeast from Townsend Street to a cut-and-cover alignment under Second Street. As the alignment approaches Howard Street, it would curve east into the basement of the new Transbay Terminal. This option includes additional tracks in a cut-and-cover section passing through the east end of the new Terminal and curving south under Main Street. This track would be used for temporary train storage and could ultimately be extended as a San Francisco to Oakland cross-bay alignment as a separate project. Development, including transit-oriented development, of publicly-owned property in the vicinity of the Transbay Terminal would enhance the Terminal area. 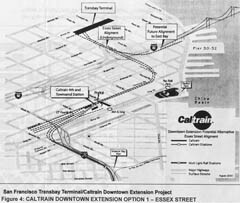 Revenues and/or tax increments could be used to defray a portion of the costs for the new Terminal and Caltrain downtown extension. Publicly-owned properties proposed for possible development are shown in Figure 6. Two development scenarios will be evaluated in the EIS/EIR. A "full build" development scenario assumes about 7.7 million square feet of residential/office/retail/hotel development, including approximately 4,500 residential units (including affordable housing), 1.1 million square feet of office, 400,000 square feet of retail, and 475,000 square feet of hotel. A "reduced scope" development scenario that assumes a lesser amount of commercial and retail development and that is weighted toward housing will also be formulated and evaluated. 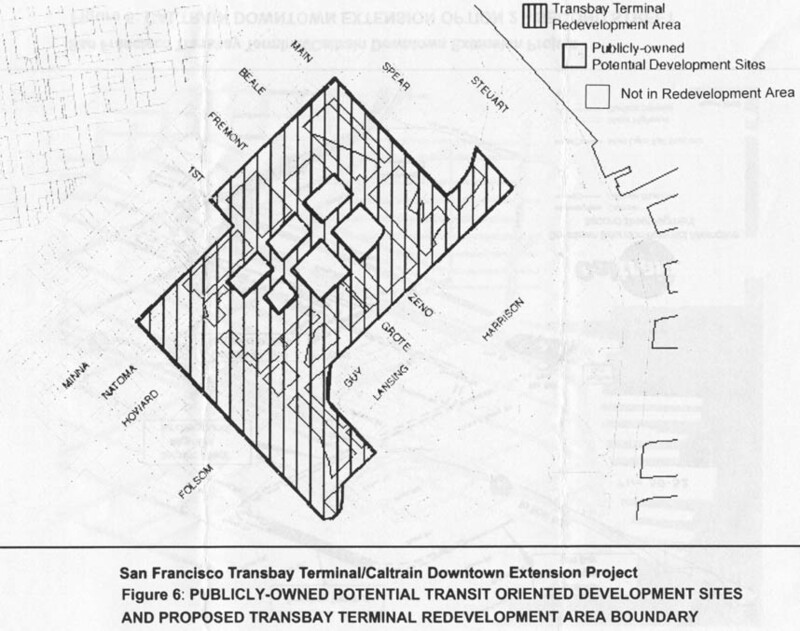 Transbay Redevelopment Project Area boundaries are shown in Figure 6. 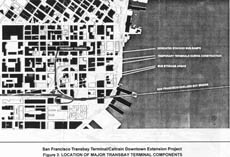 The adoption of a Redevelopment Plan for the area in the general vicinity of the proposed new Transbay Terminal is proposed to aid in the revitalization and enhancement of the Terminal area and to facilitate related development and financing of the transportation improvements. The Build Alternative is expected to increase bus and rail transit ridership and improve the overall character of the Transbay Terminal area. Environmental impacts are anticipated in the following areas: visual and aesthetic (including shade and shadow effects), air emissions (related to development), traffic, transit operations, pedestrian and bicycle operations, noise/vibration, impacts to historic or cultural resources, property acquisitions, impacts of pre-existing hazardous wastes, and temporary, construction-phase impacts. Mitigation measures will be explored for reducing and/or avoiding adverse effects. To assure public involvement at the initiation of studies on this project, meetings are scheduled at the following times and dates at locations in San Francisco County and San Mateo County. The formal scoping meetings will be preceded by an open house (6:00 - 7:00 pm) allowing for agency representatives and the public to discuss the proposed work scope and project options with project staff. A brief presentation will be given at the beginning of the formal scoping meeting focused on the project purposes and alternatives. Graphic presentations will be provided to assist the public in understanding the proposed project and design options. Project staff will be available to take agency and public input regarding the scope of the environmental studies, key issues, and other suggestions. Opportunities will be offered for comments to be provided either orally or in writing. Agency representatives, interested organizations, and the general public are invited to attend.